How to Import/Edit Nikon D7100 to Final Cut Pro (FCP X/7/6)? Nikon D7100 is Nikon’s latest DX sensor Digital SLR, and features a 24.1 megapixel APS-C sensor with AA filter removed for ultra sharp images. Video options are 1920×1080 resolution at 30/25/24p with 720 at 60/50p, quality: high or normal. You can set to microphone sensitivity manually or leave it on auto, as well as set which SD slot you want videos recorded to. You can also set whether you want to record from the 1.3x cropped area. The Nikon D7100 cam encodes footage with H.264 codec and save the files in MOV container format. The MOV format is FCP friendly but H.264 codec is not natively supported by Final Cut Pro X/7/6 because H.264 encoded contents are highly compressed and are for delivery only. By transcoding/converting Nikon D7100 H.264 .mov to Apple ProRes 422 encoded .mov file for Final Cut Pro X/7/6, the possible best quality will be retained in post-production workflow and you can then edit the resulting media files just as you would edit in QuickTime Movie format with FCP X/7/6 without rendering. We recommend you our UFUWare HD Video Converter for Mac. This is a powerful and professional Nikon D7100 Video to FCP ProRes Converter, with this Nikon D7100 Converter, you can convert Nikon D7100 MOV video to Apple ProRes 422 for Final Cut Pro X/7/6 or convert Nikon D7100 MOV video to Apple ProRes 4444 for Final Cut Pro X/7/6, then you can import Nikon D7100 MOV video to FCP easily. You can free download and try this Nikon D7100 FCP Converter. And we provided you a useful and simple guide to help you transcode Nikon D7100 MOV video to ProRes codec video for Final Cut Pro X/7/6. How to transcode Nikon D7100 1080p footage to Final Cut Pro X/7/6? Step 1. Install and launch the UFUWare Nikon D7100 to FCP Converter for Mac, click “Add video” to load individual Nikon D7100 MOV videos, or click “Add from folder” to load the whole folder. Step 2. 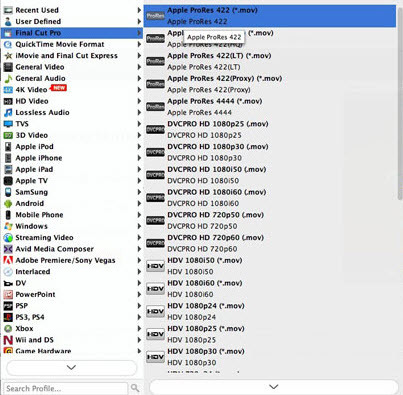 Click from droplist of “Format” and you are recommended to choose “Final Cut Pro > Apple ProRes 422 (*.mov)” as best video format for editing Nikon D7100 MOV in FCP 6/7/X as well as good video quality. 1. If you just have FCP 7 or above, you can choose these formats about Apple ProRes you like, but if your FCP on Mac is just FCP 6 or earlier, pls choose Apple ProRes 422(*mov) or Apple ProRes 422 (HQ)(*mov) in that other 3 formats are not supported by FCP 6. 2. If you want the size of the converted files be smaller, you are advised to choose Final Cut Pro>Apple ProRes 422(LT)(*mov) as the output format. Step 3. Click “Settings” to adjust the output parameters, such as resolution, frame rate, etc, customize the parameters as you want. Step 4. Click “Convert” icon on program main UI and start Nikon D7100 MOV to FCP ProRes conversion. After a successful conversion, click “Open” to locate and import the generated Apple ProRes MOV videos into Final Cut Pro 6/7/X for editing.